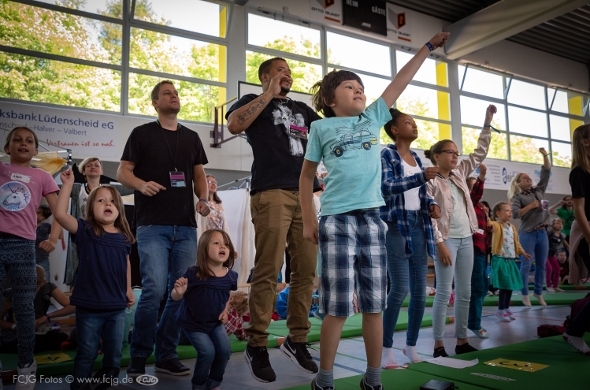 Excited and full of joy we welcomed over 200 Children ages 6 to 12 years to the Burning Heart Kids Conference. It was a special privilege to have Bill Johnson with the kids on one morning. He encouraged and tought them to believe and expect that God will do miracles through kids. Every child counts and is important for God! Jesus himself did a great miracle with the five bread and two fish of a child! Full of expectation and hunger for more, the children opened themselves for the Holy Spirit. You could feel the presence of God so strongly in the gymn hall. At least the children prayed with courage and faith for one-another and even the staff. Later physical healings happened: Children layed hands on other children and adults and prayed for them. Diverse pains of back, knee, throat, head or in the feet disappeared. Many of the children decided again or for the first time to live with Jesus. They responded to altar calls to ask for forgiveness for the things that drew them away from Jesus. We taught them about the friendship with the Holy Spirit, worship, personal calling and about listening to the voice of God. 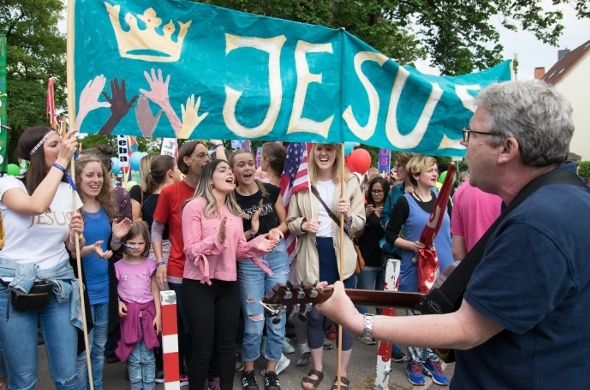 The March for Jesus has been a special Highlight of this event. The children walked ahead in front of the crowd with their families, holding up colored Jesus balloons. They praised God and prepared a way of joy into the City. Many children were touched deeply in the prayer times and had to cry, because they felt the Love of God very strongly. Some of the kids felt that they received special keys to heaven during a prayer time and they were totally excited about it. One girl sang a new inspired song over the children and the presence and the peace of God hovered over the whole place. A boy approached the microphone with wavering steps: “ I need to tell you something! I have just seen an angel. I have never seen one before. But it was an angel. He was huge and white!" Another boy discovered that God had given him a prophetic gift through inner pictures he saw that he didn’t understand before that. A little girl went to one of the staff members: „ I have stolen! I will tell my parents about it and I want to give back what I took.“ Fear disappeared and joy came when the girl fixed this matter before God and her Mum when she got picked up. During the conference we invited the kids to receive the Holy Spirit and to pray in new tongues. Many received the prayer language for the first time when children prayed for other children. One boy still walked around in his room at night when he was suppose to go to bed already. He prayed totally excited in his newly received prayer language. After one of the sessions a girl approached a staff member with a deep longing in her heart: „Would you please pray again for me to receive the new prayer language?“ She received it within a few minutes and was radiant of joy because it had been so easy. For some kids it was a real desire to be a light for God in their schools. They wanted prayer to be able to share Jesus to their classmates and their teachers. In one morning session about 20 kids came to the front to listen particular to God’s voice. They received so many impressions and inner pictures that not everyone could share through the microphone. We had them write it down and draw pictures that we posted on the wall for all to see. It’s a new Generation of Kings Kids that is growing up in our time now. There are holy callings and destinies upon their lives to change the world and to reach it for Jesus.